Migraine headaches are a chronic neurological disease condition. Migraines are not benign in that they are the number one leading cause of temporary total disability in the United States. Worldwide, migraines are reported as being one of the top 10 leading causes of disability. It is estimated that there are 38 million migraine sufferers in the United States and over 1 billion worldwide. Migraine headaches are characterized by pain occurring on one side of the head or the other. The pain is moderate to severe in nature, generally limiting activities. Associated symptoms are light and sound sensitivity with some patients having nausea or vomiting. Other symptoms like sinus congestion, dizziness or diarrhea can occur. There are 2 main groups of migraine sufferers: 1) Episodic Migraine which are defined as having 14 or fewer headache days per month and, 2) Chronic Migraine defined as having 15 or more migraine headache days per month. An exciting new treatment has been approved by the FDA as of late May 2018, for the preventative treatment of migraine. Prior to the development of this new class of drugs, no drug therapy has been designed primarily to prevent migraines. This new class of medications are called CGRP receptor blockers. This is a cutting edge technological breakthrough in migraine prevention. CGRP is a brain transmitter and inflammatory neuropeptide. CGRP plays a central role in the development of acute migraine attacks. The CGRP receptor blockers, block the ability of CGRP to trigger a migraine. 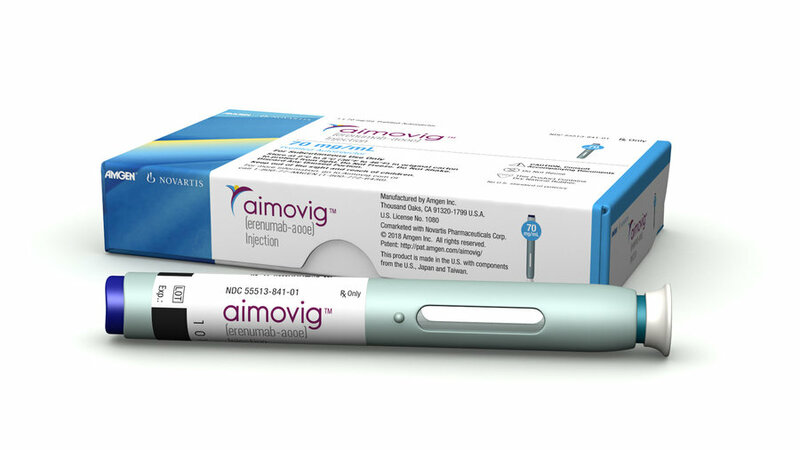 Aimovig is the first CGRP receptor blocker to be FDA approved for patient use, for the prevention of both episodic and chronic migraine headaches. Aimovig (https://www.aimovig.com/) is in a class of therapeutic medications known as Monoclonal Antibodies (MAB.) In contrast to other MAB therapies, Aimovig does not in any way interfere with the immune system or white blood cells. Aimovig does only one thing – blocks CGRP receptors to keep CGRP from binding to the receptor. This is the mechanism of stopping migraines from occuring. Aimovig is unique in migraine prevention treatment. It is given as a once a month, subcutaneous injection. It is designed for the patient to give themselves the treatment at home. It comes in an easy to use, autoinjector. The injection is almost painless as it uses an extremely small needle. If you suffer from migraines and are having over 4 migraine days a month, you may be a candidate for Aimovig therapy. See your Headache Specialist today. Do not suffer in silence. Reclaim your quality of life now.